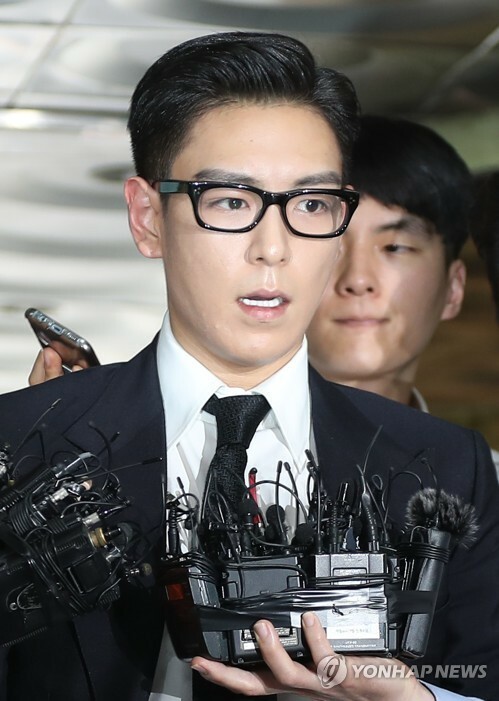 SEOUL, July 20 (Yonhap) — Popular singer and actor T.O.P of boy band BIGBANG was given a suspended sentence by a Seoul court on Thursday for smoking marijuana multiple times last year. The Seoul Central District Court found Choi Seung-hyun — his real name — guilty of the use of the illicit drug and sentenced him to 10 months in jail, suspended for two years, on par with the prosecution’s demand. He had admitted to only the first two counts but later pleaded guilty to all charges, saying he “bitterly regrets” his wrongdoing. Choi repeated his apology as he left the courthouse. “I’m truly sorry that I disappointed my fans and the public. I will do my best to make a fresh start and not to make such a mistake again with what I’ve learned from this lesson,” he said, swamped by reporters. The singer, who has been suspended from his two-year mandatory military duty as a conscripted policeman, now faces a disciplinary review by the police who will decide whether to allow him to keep his position. If he fails, he will be discharged and forced to finish his service as a public service worker, as mandated in police regulation regarding its officers indicted on criminal charges. All able-bodied Korean men are required to complete at least 21 months of military service before the age of 35 in South Korea. The illegal use of marijuana is punishable by up to five years in prison or a fine of up to 50 million won (US$44,389).